It’s artichoke season and I can’t find many people who love to eat them as much as I do. Our resident Italian guest, Albé, dislikes them, and my numerous family members, whose visits usually require a mass catering event, or the raiding of the cellar for a reasonable bottle of vino, don’t enjoy them. Mr Tranquillo hates them intensely. Back in 2000, our travels took us to Naples to visit the brother of my dear friend Olga. During that time, we were invited to lunch at the apartment of her cousins, right near the Galleria Umberto. The table was set impeccably, the hosts were gracious and also quite ancient. The whole event was ” molto elegante“. But we forgot to mention the most important thing- that we were vegetariani , and along with the language, age and cultural divides, this would become an embarrassing hurdle. First course was a simple Pasta Napoli. We were going well. Then came the polpettini di fegato. Liver meatballs, lightly crumbed and sauted. Mio Dio! Other expressions, involving the Madonna also came to mind. Mr Tranquillo turned a lighter shade of green and then quietly mentioned his dietary issues. A whole ball of buffalo mozzarella landed on his plate as a substitute. I ate the liver balls, with some trepidation, but found them quite tasty and tried to focus on the concept of bella figura. * Along came the next course – scallopini di vitello, veal schnitzels, served with a simple green salad. I also ate these, and focused this time on the Dalai Lama: I was almost enjoying this meat fest. Mr Tranquillo once again sheepishly declined, and was offered a freshly prepared giant carciofo. Knowing how much he hates artichokes, but also feeling very embarrassed and quite uneasy about insulting our gracious hosts, I gave him THE LOOK which indicated, “You will eat every bit of that maledetto artichoke and you will look like you are enjoying it!” He ate it. Back to the back yard and my giant artichoke plants. My dear friend Helen looked at them admiringly as I cut two long stems of artichokes from the bush, complete with their soft grey/green side leaves. She mused, décor or to eat, examining them carefully, whilst pondering a far more sensible question than that of Hamlet. Décor she decided. Well, I’ve done decorating with artichokes, and no more waxing lyrically about the plants’ architectural beauty. Today I plan to eat them, by myself, just me. La ricetta per carciofi in memoria della mia cara amica, Olga D’ Albero Giuliani – Artichoke recipe in memory of my dear friend Olga. Leave a small portion of the stalk and peel it. 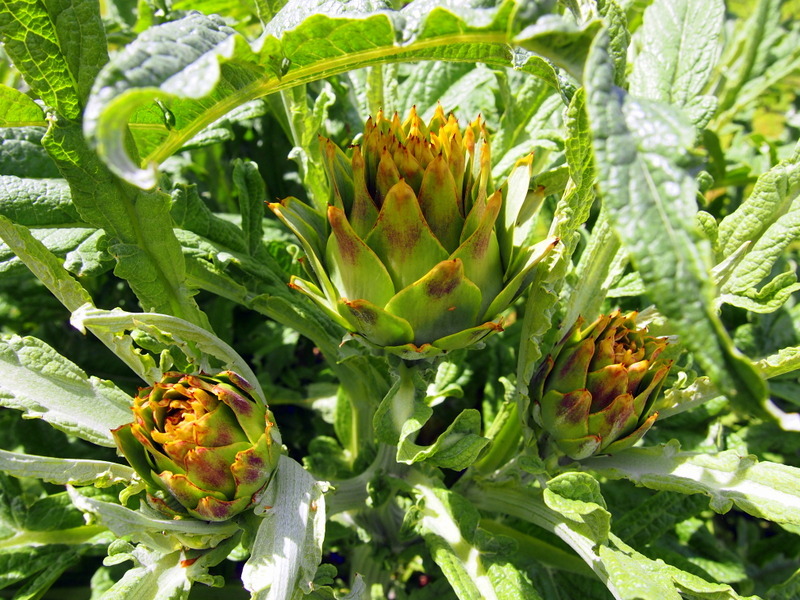 Prepare the artichokes by removing all the sharp spiky leaves, pulling them off, one at a time. When the plant looks much smaller and no sharp bits remain, cut off pointy top half then cut into quarters and remove all the hairy choke from the centre. Drop each one into acidulated water as you go. 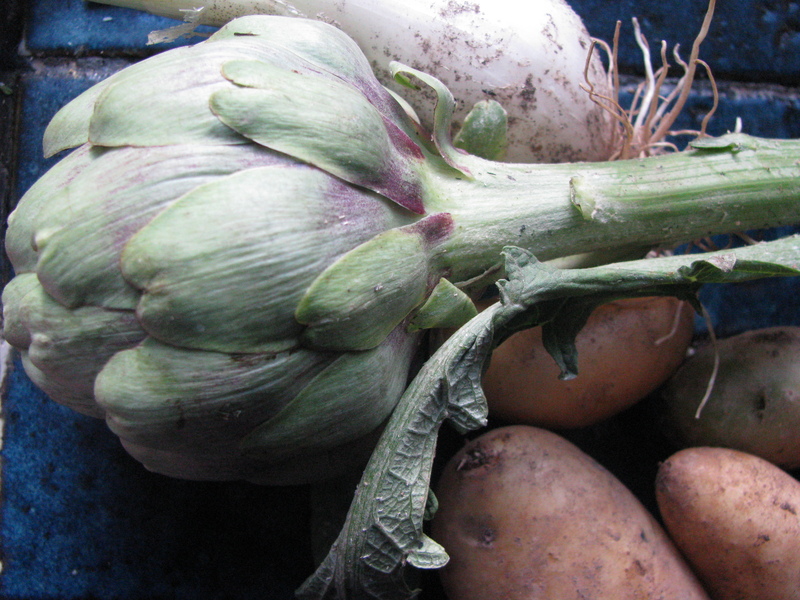 When all are ready, choose a heavy based pan, big enough to hold the prepared artichokes. Add extra virgin olive oil, garlic, sauté for a few seconds, then add drained artichokes. Sauté again for a minute or so, add some lemon juice, a little water, and salt to taste. Cover and cook on low heat, making sure that they don’t burn or catch, until tender. Eat out of the pan, if desperate, or if you can find some friends to share them with, add to an antipasti platter. I would very happily share a pan of carciofi with you, anytime, Francesca. Francesca, I love it and I love that Mr T ate the artichoke. Next Next post: Don’t Call Them Cookies.